A press release for the Derek Smart-led MMOG Alganon has churned up controversy for attributing a quote to Smart that's lifted almost word-for-word from an old BioWare press release for Star Wars: The Old Republic. 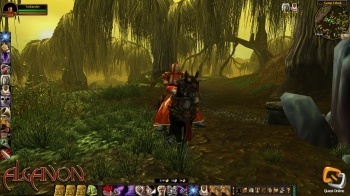 First, some background for those unfamiliar with the game: Developed and published by a company called Quest Online, Alganon launched in December 2009 as a traditional, subscription-based MMOG but was plagued by numerous difficulties, not least of which were accusations that the game was a blatant World of Warcraft ripoff. Smart, the notorious industry veteran behind the Battlecruiser and Universal Combat games, was brought in to assist soon after it launched, but by mid-March he had taken over the company as president and fired founder Dave Allen, a move which prompted no small amount of controversy in itself. Now Smart and the game are taking heat for a blunder of a different sort. In a press release announcing the "official" release of Alganon at the end of April (the original December release was re-labeled a "'soft launch' in order to soften the blow of that disaster," as he put it in a testy Gamasutra exchange) Smart was quoted as saying, "Traditionally, massively multiplier online games have been about three basic gameplay pillars - combat, exploration and character progression. In Alganon, in addition to these we've added the fourth pillar to the equation; a story. We delivered a fun, immersive adventure that gamers expect in a top quality massively multiplayer online game. To top it all off, we're not done yet. A whole new adventure with new updates will follow soon, starting with a consignment house, new classes, PvP and much more." It's a fairly standard press-release-style statement, with one slight problem: BioWare said almost the exact same thing in an October 2008 press release for Star Wars: The Old Republic. "Traditionally, massively multiplayer online games have been about three basic gameplay pillars - combat, exploration and character progression," said Dr. Ray Muzyka, Co-Founder and General Manager/CEO of BioWare and General Manager/Vice President of Electronic Arts Inc., "In Star Wars: The Old Republic, we're fusing BioWare's heritage of critically-acclaimed storytelling with the amazing pedigree of Lucasfilm and LucasArts, and adding a brand-new fourth pillar to the equation - story. At the same time, we will still deliver all the fun features and activities that fans have come to expect in a AAA massively multiplayer online game. To top it all off, Star Wars: The Old Republic is set in a very exciting, dynamic period in the Star Wars universe." Naturally, accusations of plagiarism began to fly, fueled at least in part by glee over the fact that Smart, never the most endearing industry figure, had been caught in an embarrassing situation. Suggestions that a public relations firm may have been responsible for the mess were blunted somewhat by the fact that the quote was attributed directly to Smart (and, presumably, approved by him at some point in the process) but nevertheless, an anonymous PR writer soon stepped forward to fall on his sword. "I committed a terrible blunder, considering the fiasco under which Derek took over the company and all the work he put into the game and the work I've done to stir the coverage to the game away from other controversies. And here I created a new one," he wrote. "I'm probably going to get fired for this blunder. And if that's the course of action Derek takes, I'm okay with that. I stand up for my mistakes. And this one is mine." Smart himself seemed to dismiss the whole thing in a statement released this morning, saying "it shouldn't even be news" because "practically every game related press release reads like the next one." "In truth, the reference should either have been reworded or credited and sourced. As I understand it now, that was the original intent; but they failed to make the change in their draft and which was to become the final version that went out on PRWeb," he said. "And since Quest Online - like most companies that hire outside PR firms - don't have to fact check press releases, we clearly had no idea what had happened until my inbox started lighting up on Sunday morning. This was clearly an unintentional oversight and shouldn't even be news; but here we are. Just another glorious day in the gaming industry." He also claimed that BioWare itself lifted the line from an address given by John Smedley at the 2004 SOE Fan Fair in New Orleans, although it's interesting to note that the claim appears to be based on an unsubstantiated quote posted by a user in response to the Alganon uproar. There's no question that a certain sameness pervades most press releases that hit the wires but this one gets tricky because the quote is directly attributed to Smart. It's clearly a mistake by the PR firm and Smart is taking more heat than he likely would otherwise because he's such a polarizing figure in the industry, which of course is really just a nice way of saying that a lot of people don't like him. His assertion that he's an innocent bystander in all this is probably fair, but "not even news?" That's taking it a little too far.